The suspension of Chris Williamson is shameful. 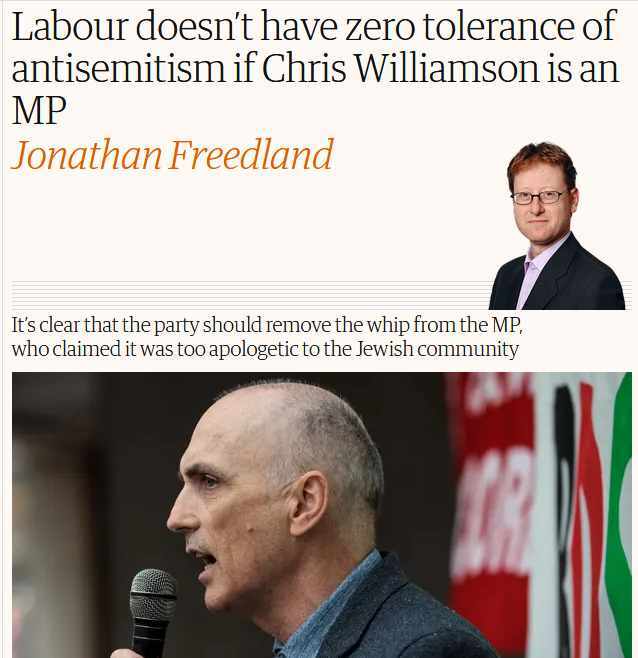 If there has been one MP who has steadfastly opposed the false anti-Semitism campaign that has been waged for the past 3½ years it is Chris Williamson. Nothing that Chris Williamson has said is anti-Semitic. 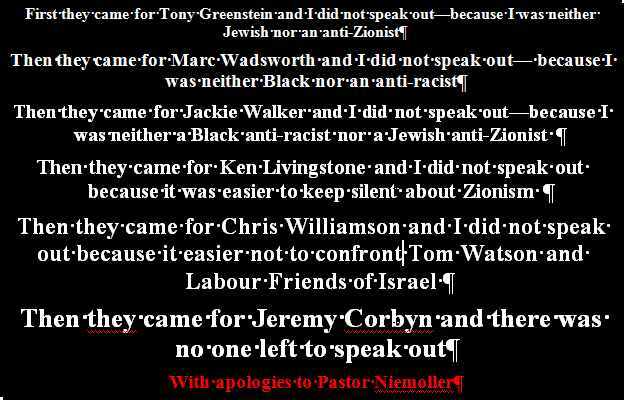 Chris Williamson is first and foremost an anti-racist MP who has defended Marc Wadsworth and Jackie Walker throughout the racist attacks by the Zionists on them. It is Chris’s accusers who have fed the anti-Semitic trolls by deliberately associating Israel’s war crimes with Jewish people. That was the meaning of the adoption of the IHRA definition of ‘anti-Semitism’. Does Corbyn really think that the Zionists are going to let up on him if he throws his friends to the wolves? It is obvious that having achieved the expulsion of Marc Wadsworth and Tony Greenstein and the removal of Ken Livingstone and Jackie Walker’s suspension that the racists and Zionists who support the world’s only apartheid state, Israel, would turn on the only principled MP in the Parliamentary Labour Party. What has happened today will not appease the Israel Lobby. On the contrary they will renew their efforts to obtain the head of Corbyn. The Zionist lobby has repeatedly called Corbyn an anti-Semite. They will not give up now but will renew their efforts until Corbyn is deposed. Corbyn is a fool for having succumbed to the demands for Chris Williamson’s head. Jennie Formby may have formally suspended him but it was Corbyn who who gave his assent. 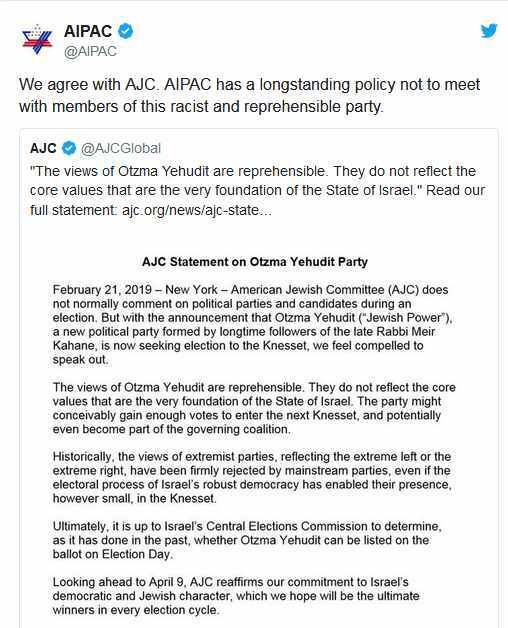 It is ironic that the Jewish Labour Movement, which boasts that it is the ‘sister party’ of the Israeli Labour Party, has said absolutely nothing about the ILP’s support for the attempt of Netanyahu to deport 40,000 Black African refugees. 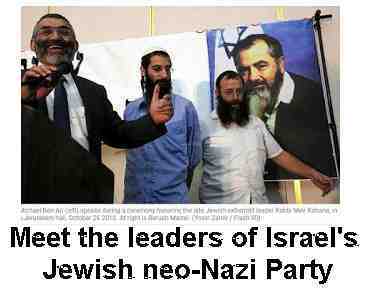 The ILP is a party that openly advocates segregation of Jews and Palestinians. It is a thoroughly racist party, which organised the original ethnic cleansing of the Palestinians. These racist scumbags are still affiliated to the Labour Party whilst good socialists like Chris Williamson are subject to a racist witch-hunt. Only last July the Jewish Chronicle and two other Zionist papers printed a joint editorial United We Stand which spoke of ‘the existential threat to Jewish life in this country that would be posed by a Jeremy Corbyn-led government.’ Corbyn was deemed a threat to the very existence of the Jewish community in Britain. In other words he was anti-Semitic. 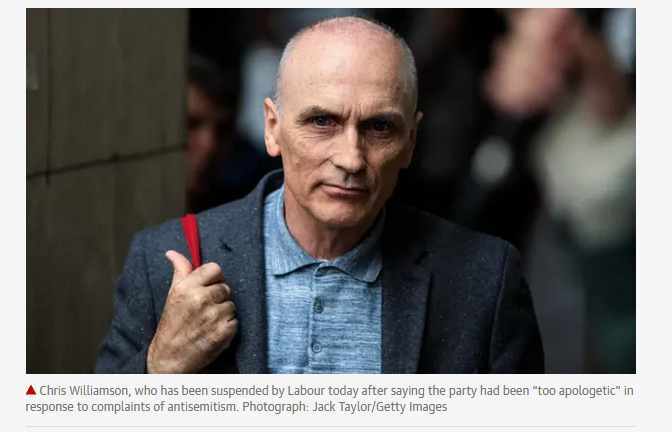 Accusations that Chris Williamson was a ‘Jew Baiter’ have been the staple of Zionist propaganda. Once again Corbyn has demonstrated that he lacks a backbone. Corbyn’s lack of loyalty to his friend and comrade are shameful. He must know that in throwing Williamson overboard he has dramatically increased his own chances of being deposed. 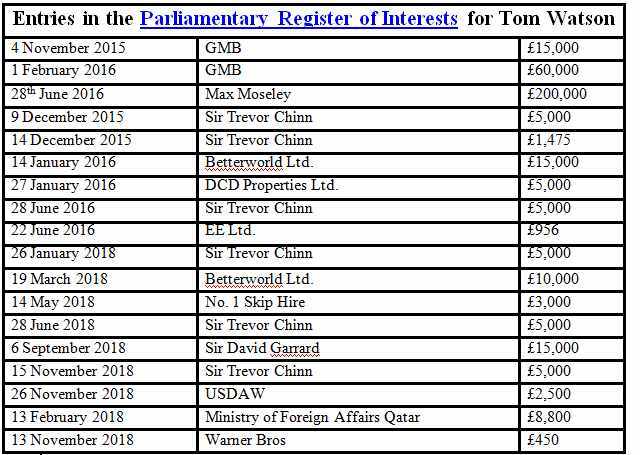 Where are all those ‘left’ Labour MPs who apparently support the Corbyn Project? Laura Pidcott, Cat Smith, Dan Carden, Dennis Skinner, Lloyd Rusell-Moyle? Their silence has been deafening. 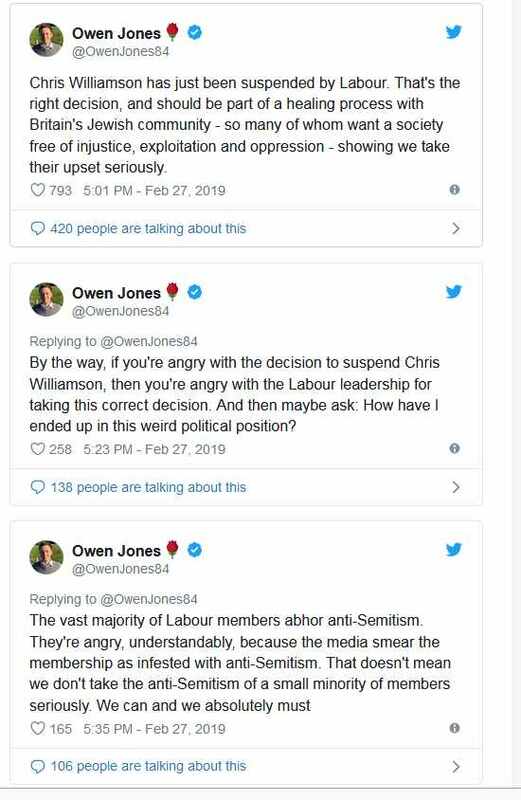 It was to be expected that fair-weather turncoat and former socialist, Owen Jones, would support the suspension of Chris Williamson. Jones has become the left face of the witchhunt. He is a racist who has long made his peace with the Jewish Labour Movement and the Zionist movement. It will be interesting to see what position Jon Lansman adopts given that the vast majority of Momentum members support Chris Williamson. Still as unelected Chair he will not be in fear of being deselected. I have organised a petition. Please support it. As the Zionist ‘Left’ Disappear will the Generals’ Blue & White Party Replace Netanyahu? In most Western countries, parties compete over issues such as taxation, nationalisation/privatisation, poverty, Brexit, refugees, global warming in general elections. Political parties in most European countries, with the exception of avowedly racist parties of the far-Right, are inclusive of ethnic minorities and supporters of different religions and faiths. It is unknown in Europe, with the exception of fascist parties, for parties to frame their arguments in terms of maintaining a demographic majority of a certain section of the population. In Israel, the self-styled ‘only democracy in the Middle East’, politics are entirely different. You have Jewish parties and Arab parties. Only the Communist Party, Hadash, and to a less extent the left-Zionist party Meretz, has a mixed membership. The other feature of Israeli politics is its political instability. Parties come and go virtually every election. So Tzipi Livni’s Hatnuah, which was the offshoot of Kadimah and in 2009 the largest party in the Knesset, latterly in alliance with the Israeli Labour Party, will disappear. There have been a plethora of 'centrist' parties in Israel, from the old General Zionists, to Shinui to Yesh Atid, each more right-wing than its predecessor. Springing up out of nowhere is the Blue and White Party an alliance of the right-centrist (though in the Israeli context labels like left, right and centre are largely meaningless) Yesh Atid and Resilience, a new party formed by former Chief of Staff Benny Gantz together with two other former Chiefs of Staff Moshe Yalon and Gabi Ashkenzi. Not for nothing is it known as the General’s Party. As Elizabeth Tsurkov of the liberal Zionist Forward observed ‘Campaign ads seem to be competing over which candidate has killed the most Palestinians.’ This is what British politicians such as Emily Thornberry and Barry Gardiner call a ‘beacon of democracy’. Presumably Jews getting to have a vote on which party can kill most Arabs is an example of democracy at its best! Likud’s Avi Dichter, a former Director of Shin Bet, Israel’s equivalent of MI5, put out a video which ends with “A thousand mothers of terrorists will cry and my mother won’t.” In the minds of most Israelis every Palestinian is a terrorist. Gantz put out an ad boasting of how many Palestinian militants had been killed in Gaza in 2014. Tsurkov wrote that these campaign ads ‘demonize, ridicule and belittle Palestinians, who are presented as a people without history, pathological liars and terrorists.’ This is Israel today. A primaries campaign video put out by Likud’s Deputy Foreign Minister Tzipi Hotoveli shows her speaking in the Knesset where she presented a book filled with empty pages. According to Hotovely, that book represents the history of the Palestinian people. She proclaimed that: “You have no Kings, no heritage sites” in Israel. An ad produced by Culture Minister Miri Regev, a self-proclaimed fascist, refers to Palestinian citizens of Israel as a “trojan horse,” and the Joint List uniting several Arab parties as a “fifth column.” Those with a sense of history will remember that accusations of being a fifth column were a favourite in the days of McCarthyism. It is a rerun of the Nazi theme of the 'stab in the back'. Gantz boasted of sending Gaza back into ‘the stone age’ during Operation Protective Edge in 2014. A boast not without foundation. Netanyahu who is playing the Arab card for all its worth accused Gantz and his party of being ‘leftists’ which in Israel today is an insult. 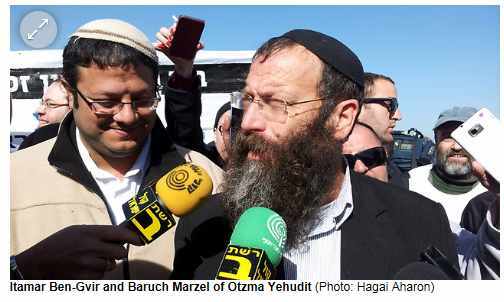 Last week Jewish Home’s Central Committee agreed to an electoral pact with Otzma Yehudit which will receive the 5th and 8th seats on the list making it all but certain that one of their members will be elected. Israel Hayom, an Israeli free-sheet which is owned by Sheldon Adelson, one of the largest donors to Trump’s election campaign, had a screaming headline calling AIPAC ‘irresponsible’ for getting involved in domestic politics. Netanyahu’s rationale was that Otzma Yehudit might, as in the 2013 and 2015 elections ‘waste’ votes by standing and thus imperil the election of a Likud government. His solution was for Jewish Home to form an electoral pact with Otzma Yehudit because a party now needs 3.25% to enter the Knesset. The Jewish Home Party is already in an electoral alliance with Bezalel Smotrich MK’s Tkuma party. Smotrich describes himself as a ‘proud homophobe’ and openly supports the segregation of Israel’s Arab citizens. He has defended the practice of Israeli hospitals which separate Jewish and Arab women in maternity wards. Israel’s General Election is impossible to call at the moment because there are a number of variables, not least the impact if Netanyahu is indicted for corruption. In most countries this would be a death sentence for a candidate but Israel is not most countries. It is clear that the Israeli Labour Party is heading for disaster. The ILP formed every single government from 1948 to 1977 as well as the 1992 and 1999 governments. It was last in a coalition government in 2011. Since then Netanyahu has formed every government. In 2015 under Isaac Herzog the ILP ran on a joint electoral list with Tzipi Livni’s Hatnuah and gained 24 seats. "In 1997, Bibi [Benjamin Netanyahu] said that 'the left has forgotten what it means to be Jewish.' Do you know what the left did in response? Forgot [how] to be Jews,"
This is the pathetic level of the ideology of the Israeli Labour Party. It is a sign of desperation of a party which has no purpose and it would seem no social base in Israel. Gabbay at the beginning of the election campaign, in front of the TV cameras, publicly humiliated Tzipi Livni by announcing that their electoral pact was over. 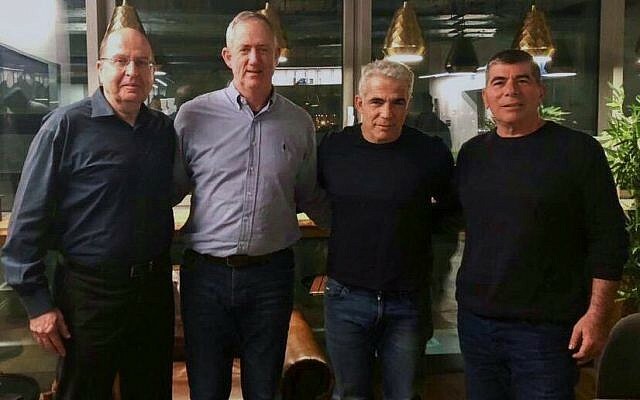 Livni, although a horrendous racist and a war criminal in her own right, is nonetheless seen as on the left in Israel, which is an indication of just how far right-wing Israeli politics are today. But if Gabbay thought that he would receive an electoral boost from this he was soon to be disappointed. The ILP ‘strategy’ of moving further and further to the Right simply alienates those Israelis still on the Left without appeasing those on the Right. Gabbay is yet to learn that however fast and far he moves to the Right Netanyahu can move even faster, even to the extent of taking genuine neo-Nazis on board. At the moment although Blue and White is estimated to gain 36 seats to the Likud’s 30, Netanyahu still has the greatest chance of forming a government coalition. Gantz’s B&W, even if it receives the support of Meretz, the ILP and Kulanu will still only have 52 seats. Given their refusal to contemplate a coalition with Arabs, Netanyahu is likely to be able to form a coalition with the religious parties (12) and the far-Right parties (15) making a total of 57. If current projections are correct then the Jewish Orthodox parties will go down from 13 to 12 seats, Kulanu - a Likud offshoot - will decline from 10 to four - and the far-Right will increase from 11 to 14. However this is to miss out one factor. 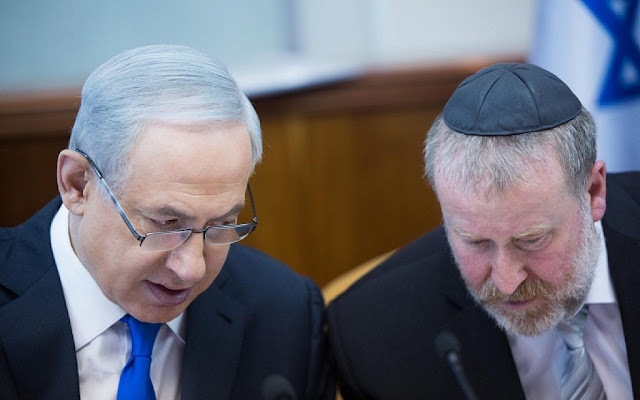 The Police long ago recommended that Netanyahu should be indicted for corruption and it is likely that before the election campaign finishes Attorney General Avichai Mendelbit will charge Netanyahu. In most states purporting to be democratic and a few which are not, that would spell the death knell of a candidate. However in Israel nothing is guaranteed. There has been a systematic campaign of intimidation against Mendelbit including the desecration of his father’s grave. Such is the nature of Israeli politics. Meretz, which originates in Ratz, the Civil Rights Party and Mapam, the United Workers Party, had 12 seats in 1992. Today they have five seats and are hovering on the brink of extinction with a predicted 4 seats. If Meretz do fail to get candidates elected to the Knesset it will be the end of a long tradition of left-Zionism, the most hypocritical face of Zionism. They talked socialism but practised segregation. Mapam talked about co-existence but their Kibbutzim were not only Jewish only but were established on the ruins of destroyed Arab villages. In March 2018 Tamar Zandberg replaced Zehava Gal On as leader of Meretz. Tamar Zandberg was elected after having hired a right-wing election fixer Moshe Klughaft as an adviser to her campaign. Klughaft was previously a strategist for Jewish Home and had targeted left-wing activists and NGO’s. Under Zandberg Meretz has focussed mainly on peripheral topics such as the environment, cannabis legalisation, civil and gay marriage to the exclusion of the major issue in Israel which is the Occupation of the Territories and the racism and discrimination against Israel’s Palestinian citizens. Zandberg is on record as stating that she would join a government coalition with Avigdor Lieberman’s Yisrael Beteinu. Lieberman is an open advocate of the transfer of Israel’s Arab population out of Israel and the imposition of a loyalty oath on Israel’s non-Jewish population. Galon called this ‘flushing ideology down the toilet” though to be fair Meretz has long ago dispensed with anything in the way of ideology. Zandberg also called on the Israeli Labour Party to form a joint party or electoral pact, which would save Meretz from extinction but Gabbay rejected this out of hand. The other major development is the splitting of the Joint Arab-Jewish List into two. Previously the Arab parties have run separately but in 2014, on the proposal of Avigdor Lieberman, Israel’s fascist Defence Minister, the threshold for election to the Knesset was raised from 2% to 3.25%. The purpose was to eliminate the Arab parties from the Knesset but what happened was that they unified in one Joint List. Ironically Lieberman’s Yisrael Beteinu nearly didn’t qualify! 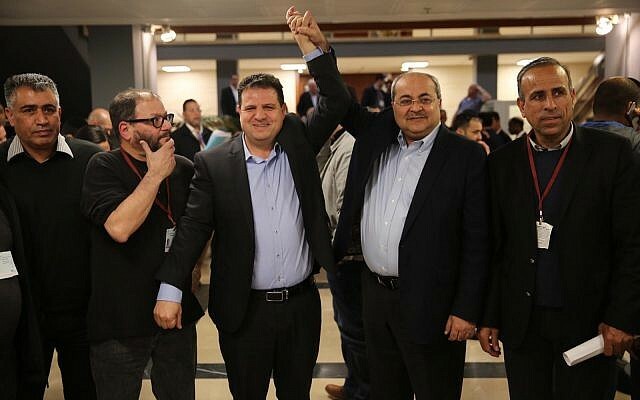 However this time around the Joint list has split into two separate electoral alliances. Ahmad Tibi’s Ta'al has combined with Haddash (Communist) and Balad (National Democratic Union) has united with the United Arab List (Ra’am). Tibi, a veteran member of the Knesset, believed that his group, was underrepresented in the Knesset. According to the Channel 12 poll above both alliances are scheduled to get 6 seats each though according to Channel 13’s poll, as reported in The Times of Israel, the Hadash-Ta'al group will get 10 seats and Balad and Ra’am will get 4 seats, which if true would be an improvement of one over the present situation. I hesitate from this distance to make any predictions about Israel’s General Election. My hunch is that Likud will be rocked by Netanyahu’s indictment and that this may propel the General’s party into power. What isn’t in much doubt is that the Zionist ‘left’, if it can be called that, is going to be heavily defeated. 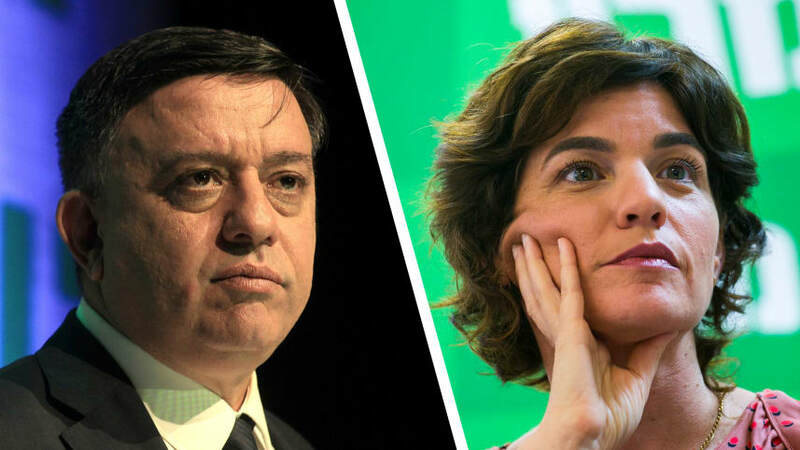 It is quite possible that Meretz, whose raison d’être has long since vanished will disappear and the Israeli Labour Party will pay a heavy price for trying to imitated Likud. On the Israeli Palestinian front it is regrettable that the Joint Arab List split. It is entirely possible that Balad and Ra’am will also fail to make the minimum of 4 seats and thus be eliminated from the Knesset. It is a great pity that firstly Ahmad Tibi put the interests of his own party above Arab unity and secondly that Hadash and the more nationalist parties were unable to unite. Hadash has always had a Jewish member of the Knesset even though it receives very few Jewish votes. The days have long since gone when Israel’s Jewish voters would elect communists to the Knesset. 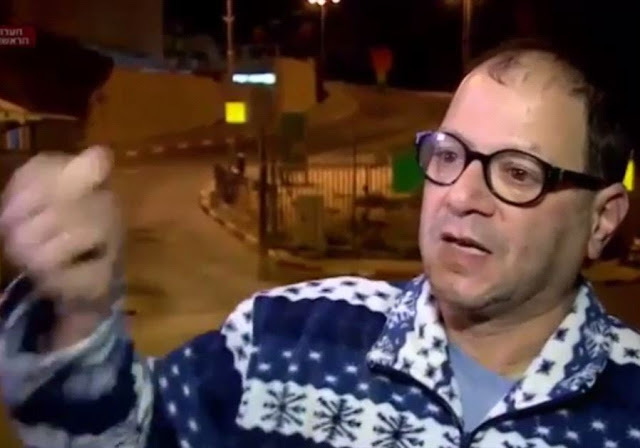 However the replacement for Dov Kheinin, Dr Ofer Cassif, a lecturer at Jerusalem’s Hebrew University is a far more dynamic character. He has had no hesitation in describing Israel today as politically similar to Nazi Germany in the 1930’s. ‘"those who refuse to see the similarities between what is happening in Israel, specifically in the past two years, and Germany in the 1930s, has a problem and will be responsible for the potential situation of the state." No doubt if Dr Casif was a member of the Labour Party he would have been suspended for ‘anti-Semitism’ for having dared to compare Israel to Nazi Germany! Alice Walker once said of Mummia abu-Jamal that "He reminds me of Nelson Mandela.". 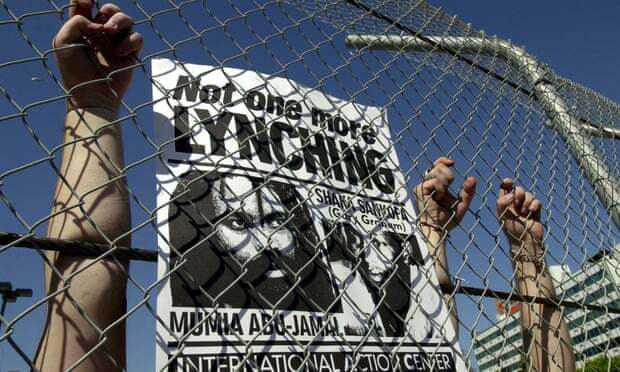 Mumia Abu-Jamal was the victim of a frame-up 37 years ago on charges of killing a cop. He is one of the last Black Panther prisoners and having caught Hepatitis C in prison, he now has cirrhosis of the liver. He was only cured of Hep C after a legal fight because the prison authorities did not want to spend the money on a cure. One assumes that given the nature of the US medical system the only cure for cirrhosis, a liver transplant, is out of the question. 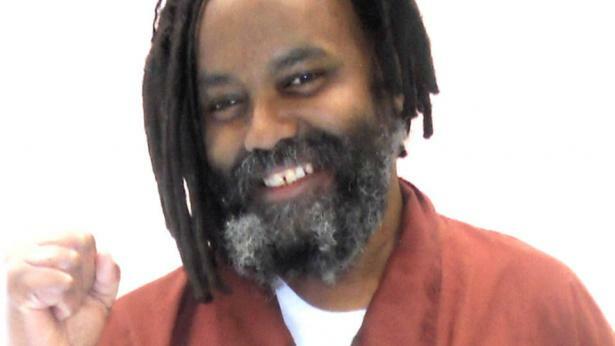 Mumia’s long and determined fight against a system that for many years kept him on death row is a testament to his political will and consciousness. It is to be hoped that the decision to give him the chance of appeal won’t be appealed by the current Pennsylvanian authorities who pose as being more progressive. By the Guardian’s count, there are 19 of them, two women included. That headcount is very slowly being diminished, as the debate around whether they have earned their freedom grows more intense with every passing year. The event at Yale organizing the REBLAW conference, happened on Friday and Saturday February 15th and 16th and was a great success. 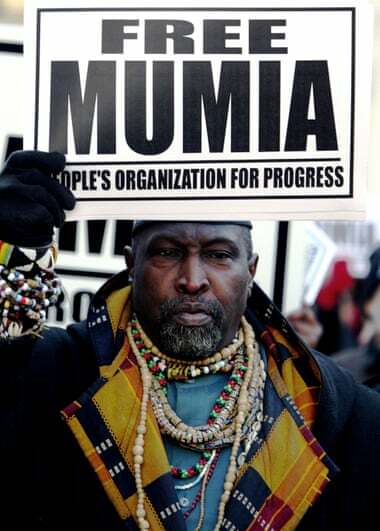 Mumia called in on Friday night. Confrontations of Krasner wherever he speaks are continuing and educating many audiences. 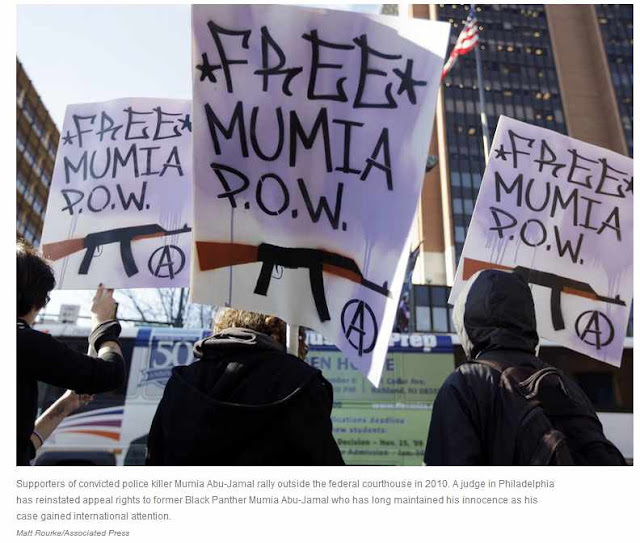 On December 27, Judge Leon Tucker, surprised and pleased Mumia supporters by ruling that Mumia was entitled to a new appeal of his case. His position was very clear: Ronald Castille, who ultimately became Chief of the Pennsylvania Supreme Court, after having worked in the District Attorney’s Office prior to becoming a Pennsylvania Supreme Court Judge, should have recused himself from the case when it came before him at the Pennsylvania Supreme Court. 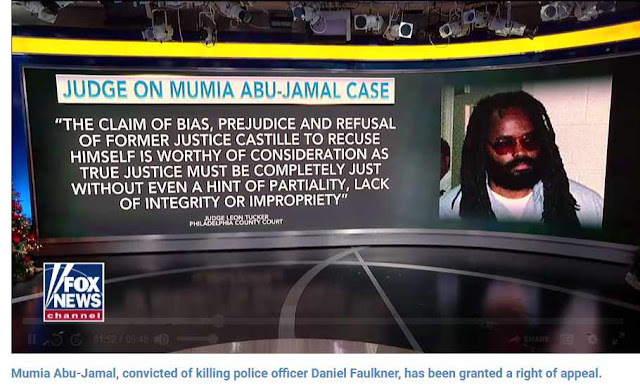 Though Tucker did not conclude direct involvement of Castille in Mumia’s case, he ruled that Castille’s well known and well publicized support for the death penalty, close relationship with the Fraternal Order of Police (FOP), and the high profile of Mumia’s case all led to the appearance of bias on the part of Castille, and that that appearance of bias was not acceptable. 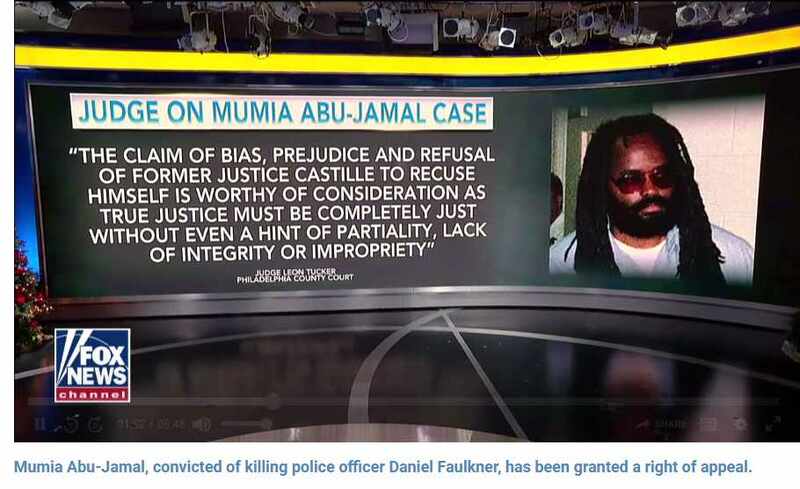 Mumia was thus granted an opportunity for a review of his post-conviction review before the Pennsylvania Supreme Court, that is, the opportunity to present all the material previously rejected on the Castille court, all over again. This was a major breakthrough in opening up the possibility of Mumia’s release. Regardless of this very significant and unusual ruling, Mumia should have of course been released long ago, in fact, should never even have been arrested since he was and is an innocent political prisoner. He was clearly framed by the police (the Fraternal Order of Police playing a major role), the prosecutors, and the judiciary, with the cooperation of other significant players in the Government and even additional sectors because of his effectiveness as a political activist and well-known writer and journalist. 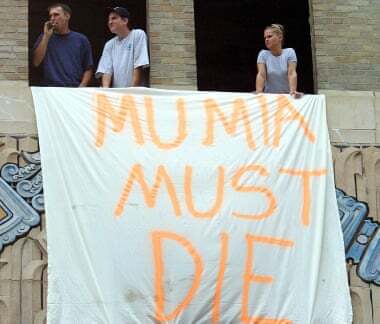 To the disappointment of some, who had expected “progressive District Attorney” Krasner to play a positive role in this case, as he had promised during his campaign to address all cases of prevous miscarriage of “justice”, Krasner appealed the very positive judge’s ruling, thus closing off the possibility of a quick process potentially leading to Mumia’s release. As word, and organizing to pressure Krasner to change his position, spread, a group of students at Yale Law School took a dramatic position in “disinviting” Krasner as a keynote speaker at a conference at Yale on “rebellious lawyers”. See letter below where the students ask Krasner to withdraw his appeal of Judge Tucker’s ruling if he wishes to speak at the conference. Mumia Abu-Jamal was immediately scheduled to replace Krasner as a key speaker at the conference. Additionally, on December 28, Krasner announced that he found six boxes of Mumia materials marked with Mumia’s name, that had not been discovered before and were therefore not reviewed in the court proceedings of the past two years! He passed that information on to Judge Tucker on January 3, 2019 and released it to the public on January 9th, 2019. On January 25, 2019 District Attorney Krasner gave notice of his appeal of Judge Tucker’s ruling!